We've returned to school after spring break and found ourselves knee deep in the busiest time of year. We're in the final quarter, heading into state standardized testing, and racing to finish curriculum. Teaching is hard, we've talked about that before. But it is also incredibly rewarding so we need to take moments to find joy and to remind ourselves and our colleagues, that we do in fact love this work. This week's Take5 is all about helping us all find ways to bring joy and happiness into our classrooms for our students and into our own lives. 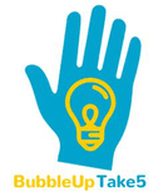 BubbleUp Classroom is on Spring Break! ​We're on Spring Break this week -- taking time to rejuvinate with our families and re-energize as we head into the end of the school year. We'll see you back here next Tuesday!